We’d love your help. Let us know what’s wrong with this preview of Something Like Gravity by Amber Smith. A near-fatal car accident first brings them together, and their next encounters don’t fare much better. Chris’s g For fans of Love, Simon and Eleanor and Park, a romantic and sweet novel about a transgender boy who falls in love for the first time—and how first love changes us all—from New York Times bestselling author Amber Smith. Enter for a chance to win a copy of SOMETHING LIKE GRAVITY by Amber Smith! 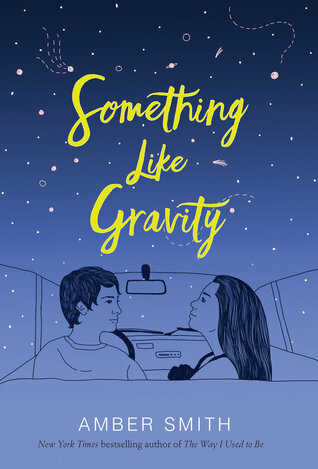 For fans of Love, Simon and Eleanor & Park, a romantic and sweet novel a Enter for a chance to win a copy of SOMETHING LIKE GRAVITY by Amber Smith! For fans of Love, Simon and Eleanor & Park, a romantic and sweet novel about a transgender boy who falls in love for the first time—and how first love changes us all—from New York Times bestselling author Amber Smith. To ask other readers questions about Something Like Gravity, please sign up. A beautiful, bittersweet young love story that examines the challenges of grief and otherness that face teens. This novel opens up human experiences and teaches compassion and understanding throughout its pages. I was given the opportunity to read the final draft of this novel and I highly recommend it to all readers. The overall book follows thematic lines of kindness, understanding and self-exploration that are so vital to the young growing older and the older seeking to understand the younger. A beautiful, bittersweet young love story that examines the challenges of grief and otherness that face teens. This novel opens up human experiences and teaches compassion and understanding throughout its pages. I was given the opportunity to read the final draft of this novel and I highly recommend it to all readers. The overall book follows thematic lines of kindness, understanding and self-exploration that are so vital to the young growing older and the older seeking to understand the younger. In her true fashion, Ms. Smith does not shy from challenging and unsettling content, but in this work it is tempered toward a message of hope and happiness--resulting in a beautiful takeaway that avoids the sap and histrionic content so common in love stories. A major driving element in 'Something Like Gravity' is the impressive strength of character. Maia and Chris are both equally unique and relatable. Their humanity is inherent in every page and I found pieces of myself in both of them as I turned the pages. They are the kind of characters you root for, the kind you care about, the kind you find yourself thinking of randomly days later after reading the book. Chris is a charming and honest example of a teen accepting his trans identity--and Ms. Smith makes a strong choice to skip the typical 'coming out' story and instead works with a kid who knows who he wants to become and is working toward becoming his true self. Maia is not a typical griever full of tears and aimed for pity, but a strong woman growing into an unnknown identity that is compelling and at times scandalous. The backdrop of this book, Carson, is a backwater Southern Town that creates a wonderful blend of isolationism and pastoralism for the characters to grow within. At times the setting almost takes on the role of a character, driving themes and scenes with the unique experience of a rural run-down single stoplight town. Instead of leaning into stereotypical scenery, Ms. Smith develops a unique and compelling world that has new surprises around each turn in the road. As for plot, I won't spoil any for readers, but Amber Smith shows her usual skill at keeping the reader so engrossed in the story that the pages practically turn themselves. Within this she blends thematic and metaphorical content via astronomy and photography that clench the artistic edge of this novel. This in not a book I would normally freak out to read based on the synopsis but IT IS AMBER SMITH. I can’t freaking wait aaaaaaahhh! Sorry. That was a bit of a rant. On a different note, I saw that at least one other of this author's books had a plot that involved a character being assaulted or attacked. This is great, and we need this representation... but I'd prefer such a sensitive story to be own voices piece, or at least written by someone of the same minority as the victim. Also, there is a trend, in popular media, similar to the "Kill Your Gays" trope. I guess it could be called the "Assualt Your Trans" trope. It's rarely necessary and I've seen it so much, it's pretty discouraging. I guess all I want to get across is: To the cis people out there who see this book and immediately think "Ah, trans boy falling in love! So cute, great representation, yay!"... just be aware that while I'm sure this author is a fantastic writer, and hopefully did her best to write an authentic story: there are so many other trans stories out there that you should reach for instead of letting books like this check the "trans-rep" box in your conscience. Stories by Own Voices authors about the struggles of being genderqueer, but also about genderqueer kids thriving! Falling in love and not being afraid! Being tough and cool and funny and passionate and ANYTHING but soft and confused. 2019, more than any other year, is The Best Year Ever for genderqueer, YA, authentic representation. So, read this book if you want, but please, please, please remember: This is not the genderqueer experience. There is so much own voices representation out there that you should explore if you're looking for authentic representation. And in conclusion, even though this isn't really related directly to this book, but still important: You shouldn't EVER read something because it has a "cute trans boy." and especially not because it has a "cute trans boi" You should read it because it has a cute boy. Period. LGBT+ rep? Particularly representation of a transgender person who's the main character of this book?? I repeat: the main character?? I'm down! It's about time the wide diversity of the LGBTQ+ community (among all of our marginalized communities) is represented in literature, movies, etc. Without the dead sister and being transgender, its a cute summer romance. With it though it becomes something extraordinary. Told from both the POV's of Maia and Chris we get to see their romance blossom and hide their secrets. I loved getting in Chris's head, I don't really know all that much about being transgender. I also liked watching Maia take her sister's camera and try to see what she saw, in an effort to feel closer to her. Something Like Gravity is a book about transgender and how it affects family as well as friendships, but especially the individual themselves. I feel Ms. Smith caught the emotions well of what it's like for a transgender person to live in today's world. The bullying they go through and how they handle it whether it be taking things with a grain of salt because you are who you are or if it gets as bad as suicide. People are who they are and should not be judged because they are I LOVE AMBER SMITH! People are who they are and should not be judged because they are different then what others perceive. Thank you for writing this story Amber Smith! amber smith writing about a trans boy falling in love for the first time??? Something Like Gravity by Amber Smith is the kind of book that leaves me feeling like it really just wasn't meant for me. And as much as I wanted to love this book, largely due to one of its main characters being deeply interested in space--which I love--and character dynamics that I had been deeply looking forward to, I was massively bored through the majority of this novel. There were very few moments where I found myself perking up to read it and, after a while, finishing the book eventually Something Like Gravity by Amber Smith is the kind of book that leaves me feeling like it really just wasn't meant for me. And as much as I wanted to love this book, largely due to one of its main characters being deeply interested in space--which I love--and character dynamics that I had been deeply looking forward to, I was massively bored through the majority of this novel. There were very few moments where I found myself perking up to read it and, after a while, finishing the book eventually felt like a chore. Which, ultimately, is something I'm rather disappointed with as I really wanted this book to succeed. The main character is trans-male, something I have unfortunately only come across in fiction once prior to this book. If that's not a sign that we need more trans characters in fiction, I don't know what is. And so, I was excited to get a chance to read this one and I looked forward to singing its praises. But, try as I might, I just couldn't get into the story. And I think it was because of Maia, the young girl who lives next door to main character Chris' aunt with whom he is staying for the summer partially as a result of bullying in his hometown and partially out of a desire to get away from his parents. You see, Maia's sister has died recently and she's working her way through grief by carrying around one of Mallory's old cameras and attempting to understand her sister through the photography she loved so much. I think, ultimately, I just didn't really care all that much about Maia's story. I didn't understand Chris' interest in her, and at the end of the day she was the one driving what the two of them got up to during their time together and it was so damn dull. Now, the funny thing about it all is the fact that it was decently reminiscent of how I might've spent my summer when I was that age, but the problem that brings me is the fact that I spent many of my summers fairly bored. And I don't know who in their right mind would want to read a book that follows one of the more dull summers they've ever had. And this, my friends, is why I tend to avoid contemporary when I can. I find, more and more, that those stories are not the kind that I find interesting. And while I will say that this story definitely wasn't for me, it might be for you. If you're a fan of contemporary and you want to read a story about a transgender boy working through issues I imagine many might (and honestly, this was the highlight of the book), and a girl dealing with loss, then maybe you'll enjoy this. If you don't like contemporary, though, I'd avoid it. I received an ARC for this book from Edelweiss. It’s a really beautiful look at life as a transgender teen and his first live. I enjoyed this one and will probably purchase for my library’s YA section. I fell in love with this book from the first page and was captivated the entire time by the emotions woven into such amazing story telling. Despite dual perspectives, the writing never loses its flow and instead gains something from the constant back and forth. Oh my god! I’m blown away! I LOVED Something Like Gravity! I brought your book to Jamaica with me and couldn’t stop reading it! It made me laugh, cry, wonder, think, and almost every other emotion there is. You are an unbelievably artistic writer! The book made me feel like I was truly a part of Chris and Maia’s lives. I am so, so proud of you! Oh dang, I finished this a minute ago but didn't update Goodreads. Thanks to publisher for an ARC in exchange for an honest review. I loved it. Speaking as a trans guy and a young adult librarian this book nails it in a way that didn't feel exploitative. I wish I had it when I was a teenager. Something Like Gravity is a beautiful story about a transgender boy finding love for the first time. Most importantly, a love who understands him and loves him as he is. It’s such a beautiful and important love story. Words cannot express how much I love this book. My heart absorbed every word in this book. The acceptance. The brutality. The sadness. The grief. The anger. All of the emotions, my heart just sucked them all in. I swear, my heart expanded th I received this book for my honest review. Words cannot express how much I love this book. My heart absorbed every word in this book. The acceptance. The brutality. The sadness. The grief. The anger. All of the emotions, my heart just sucked them all in. I swear, my heart expanded three times it’s size after reading this wonderful book. I think there needs to be more books with a main character who is transgender. It’s such an important topic today and it’s one that’s discussed quite often. Amber Smith is not transgender herself, but I feel like her book does a magnificent job at portraying it. Amber Smith is the queen of series topics and getting them on paper properly. I loved the family dynamics in this book. I love that not everything is perfect. That’s how it is in real life! Not everyone is so accepting automatically. Amber Smith does a great job at showing all kinds of acceptance in this book. Chris and Maia are amazing characters. Words cannot express how much I adore them. Especially Chris, he’s such a genuine person. And Isobel. I love her with my entire heart. She reminds me so much of my grandmother, it hurts. I would just love to thank Amber Smith for writing such a beautiful book. I feel like this book could help so many people. Whether you’re a transgender yourself, or you’re dating a transgender person. Heck, even if you’re a parent to a child/teen who told you they’re transgender. Everyone should read this book. This book will touch the lives of many. Also, I need updates on Chris! A year ago, Chris was badly beaten by group of males who hated Chris for being trans. A year ago, Maia lost her sister Mallory due to an undetected heart defect. Now, Chris finds himself in a small town in North Carolina, ten hours away from his home in Buffalo, spending the summer with his aunt after his parents decide that they need some time separate from him. Maia finds herself avoiding all of her friends, wallowi Disclaimer: I received an eARC through Netgalley in exchange for an honest review. Maia finds herself avoiding all of her friends, wallowing in grief, unable to live for herself. But on the day that Chris moves in with his aunt, they unexpectedly meet after Chris almost hits Maia with his car. The two then slowly become friends while considering the possibility of a romance. Something Like Gravity is an honest look at what can happen when two people, left broken in different ways (Chris with his possible parental rejection and trauma from being beaten, Maia with losing her sister), find each other. While this read can be heavy at times, it feels real. While I cannot speak on the accuracy of the trans rep, it doesn’t feel exploitative, and the author appears to have done her research. The grief from Maia and her family feels extremely real as well. Chris is spending the summer with his aunt in North Carolina after being homeschooled for the past year after a terrible assault. Maia lives next door to Chris's aunt and is trying to recover from her sister suddenly dying. Their first meeting is when Chris almost runs over Maia, so a friendship doesn't look promising, but they're going to be neighbors for the summer, so Chris tries to make it up to her. Something like Gra I received a digital ARC of this title from Edelweiss for an honest review. Something like Gravity is a sweet YA book about moving forward after trauma. It's recommended for fans of Love, Simon and Eleanor & Park. I am so excited about the young adult genre embracing diversity in many upcoming releases. Books like SOMETHING LIKE GRAVITY are important because they speak to people, let them know they're not alone in what they're going through. And for those of us who haven't had a similar experience as Chris and Maia's in this book, it helps us understand and treat others with empathy. Full review to come one month prior to publication date! A sincere thanks to NetGalley and Simon and Schuster Children's Publishing for providing an advanced reading copy of this book in exchange for an honest review. This was incredible. This story follows Chris, a transboy teen, and Maia, his next door neighbor after Chris chooses to live with his Aunt for a few months. So, this was amazing at breaking both Chris and Maia and why they worked together and also why they didn’t. It took complex themes and wove them into a kinda cliche narrative about two people, and two families, on the brink of collapse, and turned it into a cropping, sad, and inspiring contemporary. Character-driven books that deal with tough stuff have always been my favorites because .all humans can find a way to identify with the story. This was a fierce, honest love story. It was my first book with a transgender main character, and I hope to read more as the years go on. I’m excited to have this available to my students when it gets published! In the synopsis of this book, it says "For fans of Love Simon and Eleanor and Park..."
The movie version of "Simon Vs The Homosapein Agenda." I really hope they meant the book. But you know what? I'm willing to overlook this book-name error because this. Sounds. So. Good. Amber Smith portrayed Chris and Maya and the struggles that they were dealing with beautifully. I felt an emotional connection with them throughout their journey. I would not be surprised to see this book on the New York Times bestsellers list. A beautifully written, powerful story about love, loss, accepting who are and accepting others. Told from alternating perspectives, Something Like Gravity is a must read. Amber Smith is the New York Times bestselling author of the young adult novels The Way I Used to Be, The Last to Let Go, and Something Like Gravity. An advocate for increased awareness of gendered violence, as well as LGBTQ equality, she writes in the hope that her books can help to foster change and spark dialogue surrounding these issues. She grew up in Buffalo, New York, and now lives in Charlo Amber Smith is the New York Times bestselling author of the young adult novels The Way I Used to Be, The Last to Let Go, and Something Like Gravity. An advocate for increased awareness of gendered violence, as well as LGBTQ equality, she writes in the hope that her books can help to foster change and spark dialogue surrounding these issues. She grew up in Buffalo, New York, and now lives in Charlotte, North Carolina with her partner and their ever-growing family of rescued dogs and cats. You can find her online at AmberSmithAuthor.com.